Where on the Moon is Jack Schmitt's Hammer? While watching Apollo 17 video tapes, I saw Harrison H. "Jack" Schmitt toss his hammer off into the distance. Recently while browsing the Apollo Lunar Surface Journal I happened across some B&W images taken by Gene Cernan at the end of the last EVA and what did I see in one of those images up in the pitch black sky? A small streaky image that looked like it might be the hammer in flight. So, I examined some prints in the Lunar and Planetary Lab's Space Imagery Center and sure enough, it is the hammer which can be seen in two consecutive images (end on in the 2nd) and in a 3rd, I found the plume of dust from the hammer's impact! Curiosity led me to dig up some images taken from inside the LM after the EVA and sure enough, with the help of the plume image telling me where to look, I found several images which show the hammer lying out on the lunar surface! Go see the images. There are a number of individuals who believe that the Apollo moon landings were faked by NASA and the U.S. government. Several websites expound this notion and even analyze images to attempt to make their case. See my critique of one of these pages. 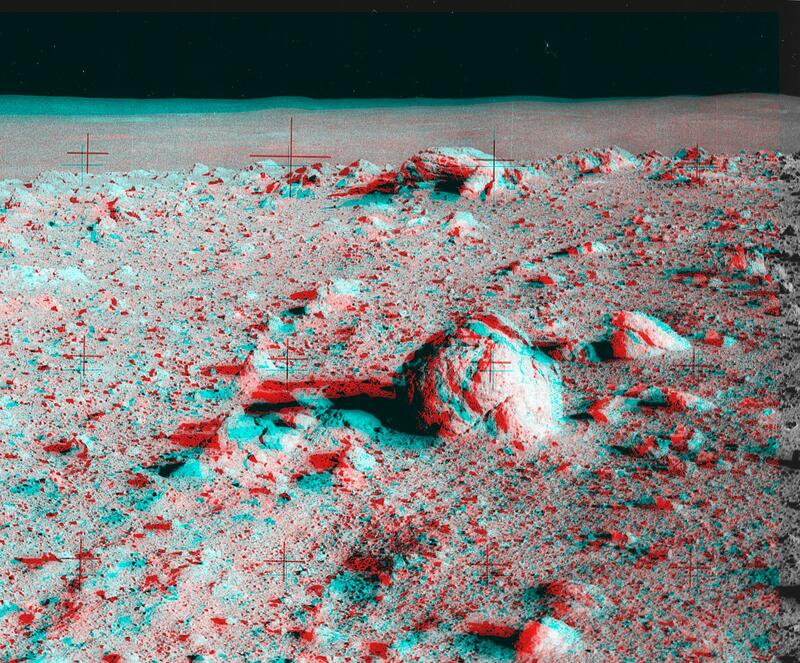 The following 3D images were made from a pair of images obtained by the Apollo 17 astronauts in December 1972. The specific images used here are AS17 139-21287 and 139-21288. Apollo 15 and Apollo 17 were the only flights that came close enough to get long distance oblique views of the most prominant rayed crater on the Moon. Copernicus is a 95 kilometer diameter crater formed by the impact of an object about 10 kilometers in diameter about 1 billion years ago. Full resolution 3-D image of Copernicus. Low resolution 3-D image of Copernicus. This anaglyph was composed by combining images AS12-48-7099 and AS12-48-7100. 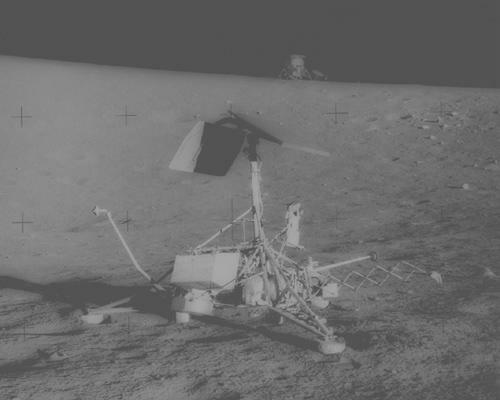 The images were taken by the Apollo 12 crew as they approached the Surveyor III spacecraft. The 3D affect is rather subtle, as the photographer (Bean?) walked towards the Spacecraft with very little translation. During the second EVA of the Apollo 14 mission to the Fra Mauro highlands, astronauts Alan Shepard and Edgar Mitchell climbed the flanks of Cone crater about 340 meters in diameter and some 80 meters above their Lunar Module, parked some 1.2 kilometers to the southwest. During a frustrating and tiring climb, they were unable to locate the rim of the crater, leading to great disappointment, though they did manage to sample a boulder field near the rim which scientifically was just as good as getting to the rim of the crater. So how could they have ended up within about 30 meters of the rim without knowing it? 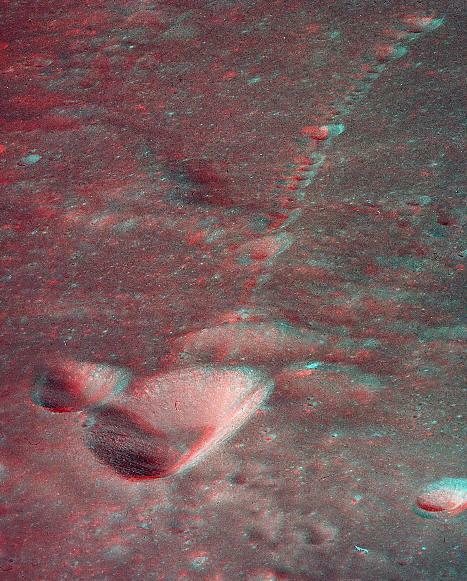 These 2 anaglyphs are derived from a panorama taken by Alan Shepard at station C', abut 70 meters from the rim of the crater. They are looking in the general direction of the crater rim. Station C1 is about 40 meters in this direction, amongst the clump of boulders in the medium distance and was the closest that Shepard and Mitchell got to the rim. The LM is 1.2 km away about 90 degrees of azimuth towards the left. Images AS14-64-9101, 9102, and 9103 where used to construct these two anaglyphs. The following anaglyph is from the Apollo 16 mission. The rover appears at the top of this section combining AS16-107-17445 and AS16-107-17446 taken by John Young. Visible in the foreground is the Gnomon which was used to provide the local vertical and a color strip for later photographic calibration. 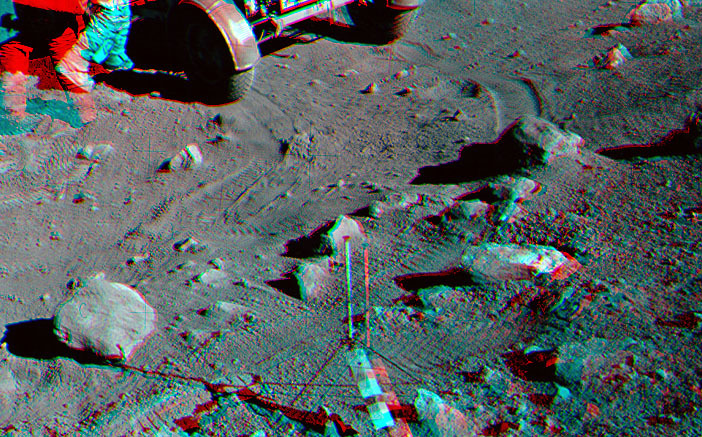 The surface appears very uneven in this stereo view and the rocks stand out nicely as well, particularly the rock at left. BTW, AS16-107-17446 is a favorite of the TMLWF (The Moon Landing Was Faked) crowd and they cite problems with reseau marks on this image, shadow directions and even a "C" which appears on the rock at left in some versions (which is clearly dust introduced at some point in the processing of the image for publication). The hoax proponents do not take into account perspective issues or the unevenness of lunar terrain in their arguments regarding shadow direction and lengths. 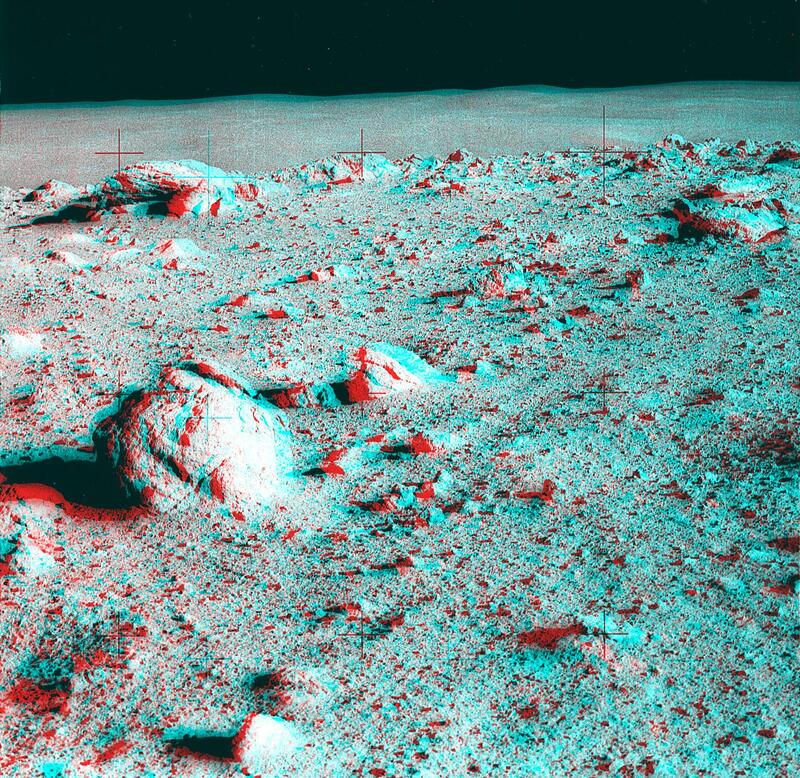 This stereo view should help the viewer see how shadows are affected by the terrain. 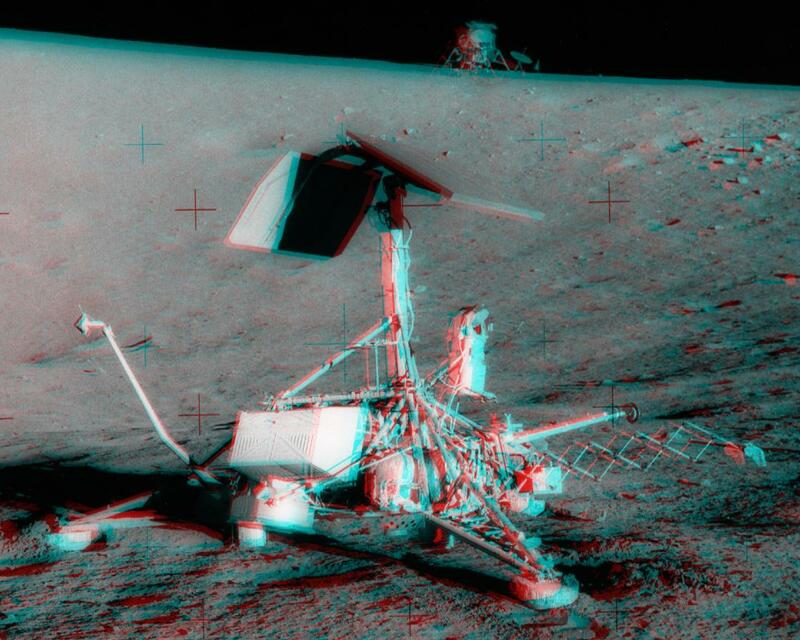 Ignore astronaut Charlie Duke in the anaglyph, as he moved between the exposure of the two images, resulting in the ghostly red and blue images at top left. We're On our way, Houston! Virtual Apollo by Scott P. Sullivan - Review coming soon. Virtual LM by Scott P. Sullivan - Review coming soon. Saturn by Alan Lawrie - Review coming soon. Apollo: The Definitive Sourcebook by Richard W. Orloff and David M. Harland - Review coming soon. Return to the Moon by Harrison H. Schmitt - Review coming soon. Two Sides of the Moon by David R. Scott and Alexi Leonov. Review coming soon. Rocket Man by Nancy Conrad, Howard A. Klausner (2005). Review coming soon - the biography of Pete Conrad. First Man by James R. Hansen (2005). Review coming soon - the biography of Neil Armstrong. From the Earth to the Moon (1998 - miniseries). Using Apollo 13 as a springboard, Tom Hanks took the next logical step and produced this 12 part mini-series for HBO on the entire Apollo program. Hanks commits the film crew to stick to the historical details and produces a generally outstanding series of films. My favorite episodes (in airing order) included Apollo 1 which deals with the tragedy of the Apollo 1 fire and its aftermath; Spider which follows the design and developement of the Lunar Module through its first manned flight on Apollo 9; Is that all there is? 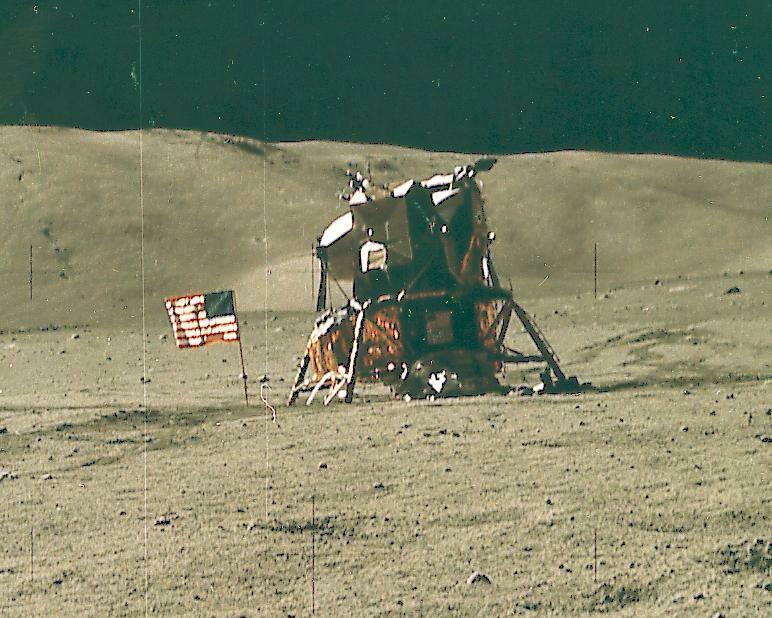 the experiences of Al Bean on the flight of Apollo 12; Galileo was Right which covers not only Apollo 15, but the geologic training of the Apollo Astronauts, especially for this flight; and La Voyage Dans La Lune which summarizes the Apollo program while covering the flight of Apollo 17. My least favorite episode in this series was We Interrupt this Program which details the media interraction with the nearly fatal flight of Apollo 13. Apollo Lunar Surface Journal This site contains not only annotated transcripts from each of the moonwalks, but a library of the lunar surface imagery, audio files, video, scans of checklists, maps and a great deal more. This is perhaps the best site on the web (and now available on CD!) for the Apollo enthusiast. The Apollo Saturn Reference Page This site contains everything you'd ever want to know about the Saturn launch vehicles as well as the Apollo Spacecraft and the launch complexes. The information is geared towards the space modeller. A Field Guide to American Spacecraft Where are the Spacecraft flown by our Astronauts? This web site tells you where they are located. Not only manned vehicles but boilerplates, models and so on. Chariots for Apollo: A History of Manned Lunar Spacecraft This web document is from the book of the same name (NASA SP-4205). This is a great source of information about how the Apollo spacecraft was designed and built, from the earliest concepts through the first moon landing. Lunar Module, Spacecraft Assembly & Test, Grumman Bethpage NY This site contains a wealth of inside information about the only spacecraft to land humans on another world - the Apollo Lunar Module. Apollo Landing Sites Where did the Apollo missions land? Dan Durda created this site which allows you to zoom in on each of the landing sites, from the general setting to the actual site of the landings. NASA History Home Page NASA's history office web site. The "Contact Light" Project Apollo Archive This site created and maintained by Kipp Teague contains his personal memories of Apollo as well as a great collection of Apollo imagery and multimedia. Apollo 15 Flight Journal The Apollo 15 Flight Journal does for the rest of the Apollo 15 flight what the Apollo Lunar Surface Journal (ALSJ) does for the Apollo 15 lunar exploration. Hopefully future versions will include the other Apollo missions. Apollo Press Kits The Apollo Press Kits have been scanned into PDF format and are all available on this site. An excellent source information on each of the missions. Space Suits online If you want to find out more about space suits, this is the place. The site includes descriptions of suit hardware as well as photos and locations of suits that are on display at various museums. Moon Trees Apollo 14 astronaut Stuart Roosa carried tree seeds on his flight as Command Module Pilot which were later planted and grown. This website is dedicated to finding the lost Moon Trees and their progeny. The Apollo Experience Do you long to fly in space and to the Moon? This site advertizes an Apollo based simulation of just that. Want to join the Space Exploration Web Ring?